▪ We enjoy a lot of privilege, but we also feel a lot of pressure. ▪ We’re in high demand, but the people who want us have no idea what we do. We are a troubled lot… @codepo8 ▪ We’re better off than ever in terms of tooling, technology and standards support – yet we feel that if we don’t innovate, someone will eat our lunch. In summary… @codepo8 ▪ We’re past a stage where developers have the chance to learn the trade before applying it ▪ Our editors are much more than dumb text writing tools and not as overwhelming as huge IDEs. ▪ We tend to buildz products using a toolchain we customise to the need of the product ▪ Both are an opportunity to instill a sense of ownership to developers and to learn about our mistakes before our users suffer from them. View Bringing best practices front and centre on Notist. We have a lot of best practices on how to build good software. We seem not to follow them though and new developers don't have time to learn them before delivering their first products. 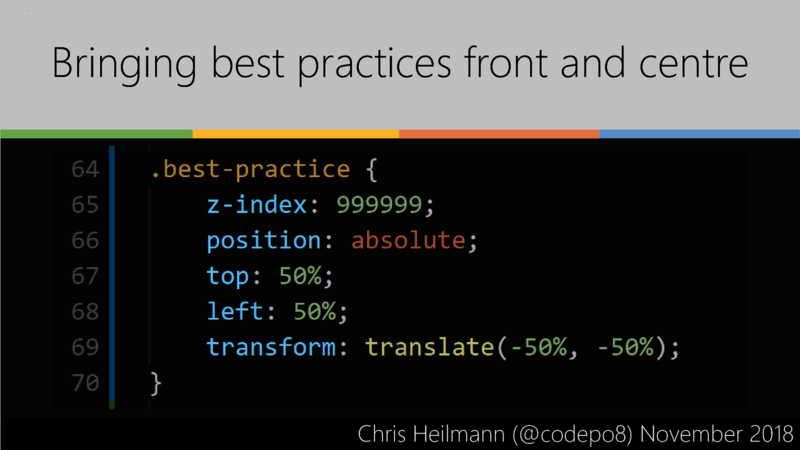 Why not make sure developers get information about best practices whilst doing their job? With Node and open, extensible editors we can do that. Are you suffering from full stack anxiety? First @halfstackconf talk of the day is @codepo8 on "best practices" in coding (and "full stack-overflow development" 😄). Check out the video afterwards - all talks are being streamed! Great start to this year's #halfstackconf with @codepo8.